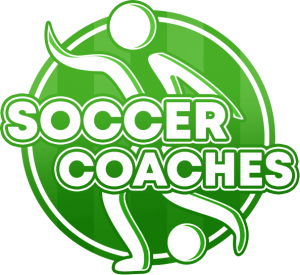 Goal: This soccer passing exercise focuses on practising accuracy and weight of passes. This soccer passing drill also develops one touch passing, wall passing, laying balls off, sharp touches and supporting movements. Create a 12×12 meters square and a smaller about 8×8 meters square inside the bigger area. Place one player to the cones. After their passes players return to their starting positions. 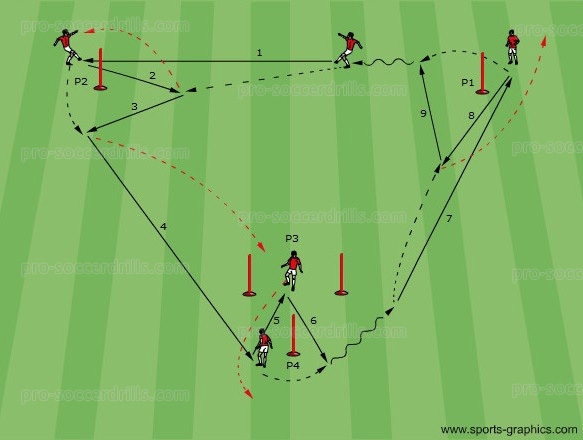 After a determine number of repetitions the players change positions between A and B cones. 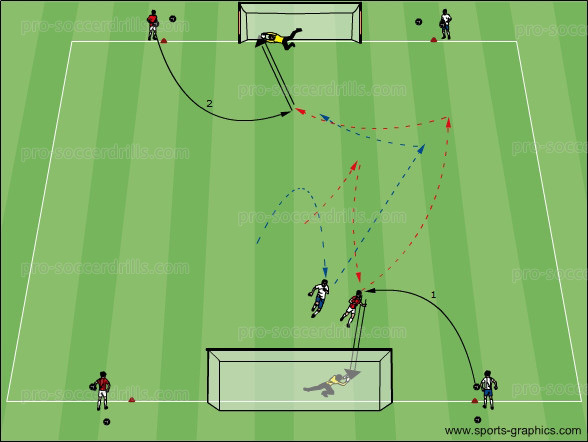 Soccer Passing Drill, variation 1: A1 starts with a short pass to B1 who lays it back to him. Then A1 delivers a sharp, strong one touch pass to A2. A2 lays it off to B2. After that the progression is the same in each corner. Soccer Passing Drill, Variation 2: A1 passes to the supporting B4, and gets the ball back from him. After the wall pass with B4, A1 forwards the ball to A2. In that moment B1 goes to support A2. The same progression is repeated in each corner. Soccer Passing Drill, Variation 3: The supporting player comes from the diagonal corner.